One of America's favorite comic features for the last 30 years has been "Vignettes of Life," a gently satirical cartoon treatment of human foibles and social mannerisms. No less today than at the time of its inception, this feature appeals to many readers because of the deftness of its characterizations. Readers can usually identify familiar personalities from among the cartoon characters—the man next door, the girl at the office, the youngster who lives in the corner house down the block. "Vignettes" is created each week by Harry Weinert in the Inland Empire magazine of The Spokesman-Review on Sundays. Weinert was born in Royersford, Pa., in 1901, and developed an interest in art while attending Royersford public schools. His art training was furthered through studies at Corcoran School of Art, Washington, D.C.
After joining the art staff of the Philadelphia Public Ledger, Weinert continued his studies at the Pennsylvania School of Industrial Art, and later continued his studies abroad. As a free lance artist he contributed to such publications as the Saturday Evening Post, Esquire and the Philadelphia Inquirer. His spare time art work is devoted chiefly to the study of early American arts and crafts, particularly Pennsylvania Dutch. Aside from the art field, his hobbies are travel and when possible, chugging around Great Egg Harbor bay, New York, in an outboard motorboat, crabbing and fishing. [Harry S. Weinert was born in Royersford, Pennsylvania on September 2, 1901; his birthdate is from the Social Security Death Index. In the 1910 U.S. Federal Census, he was the only child of John and Nellie. They lived in Royersford at 252 Washington Street. His father was a glass blower. The magazine, St. Nicholas, July 1917, published a list of young adult contributors to the St. Nicholas League. The "Roll of Honor" list included Weinert, for his drawing. The Weinerts remained at the same address in the 1920 census. Weinert was a newspaper artist. A New York passenger list, at Ancestry.com, recorded his return from Europe. Aboard the S.S. Republic, he sailed from Bremen, Germany and arrived in New York City October 16, 1928. His address was 619 North 17 Street in Philadelphia. He has not been found in the 1930 census. According to the Philadelphia, Pennsylvania, Marriage Index, at Ancestry.com, he married Regina M. Scally in 1936. Philadelphia Inquirer Gold Seal Novels has an annotated list of illustrators, including Weinert, who contributed from the 1930s to the 1950s. The Philadelphia Directory 1950 had his address as "702 S Wash Sq". In 1952, he took over Vignettes of Life when Kemp Starrett passed away. Artists are supposed to be such very queer people. The popular conception of an artist is apt to be a temperamental eccentric who starves in a garret along with several lower class rodents. His nights are spent in ultra-bacchanalian orgies, popularly known as studio parties, his afternoons dedicated to his favorite model. The Starretts—Kemp and Henrietta McCaig—are likely to upset the conventional idea. A bombshell, as it were, in the popular fancy. Henrietta McCaig Starrett is the very same Henrietta McCaig Starrett whose delightful illustrations you find several times a month in the Saturday Evening Post. And Kemp Starrett's pencil furnishes Life, the New Yorker and the Saturday Evening Post with many of their sophisticated satiric sketches. They are Brooklynites, now living in Forest Hills. It is in the charming living room of their red-brick, much bewindowed home that we find ourselves. "Why do you think that the private life of the Starretts should make interesting reading? asked Kemp, as he sank still further back into his chair. "We are not leading especially thrilling lives at the moment. We haven't the time. We are too busy to indulge in flagpole sitting or iceberg exploring—the stuff that current reading matter is made of. Of course, there may be Richard Halliburtons among artists as there are among writers; but you can't swim the Panama Canal in the morning and draw pictures in the afternoon. At least I wouldn't care to try." "I wouldn't even swim the Gowanus Canal in the morning," said Mrs. Starrett. "The life of a creative worker is always interesting," I said. "So many of us are artists at heart and we would like to know how real artists live. Besides, Brooklyn is always glad to hear of a local boy who has made good." "But what about local girls?" asked Mrs. Starrett. "Local girls, too," I assured her. "One of the most prevalent fallacies about artists," observed Mr. Starrett, "is that they never work hard. It is true, of course, that some—myself, for instance—follow art to avoid going to work, but it usually turns out that they work harder than they might have if they had become traveling salesman for, let us say, a deep-sea divers' outfitting concern. Drawing requires an infinite capacity for taking pains, as well as an innate sense of the significant that is really nothing but good taste. Every line should have some thought behind it. One stroke may make or ruin a picture. For the work that seems the most casual is often the most careful. "A similar mistaken idea is that drawing is easy because the artist can daydream. It should be obvious that one is not creating when working mechanically. You cannot do anything important while you are wool-gathering in New Zealand or Montana or wherever it is that wool is gathered. Let's see, what else does the popular mind believe about artists?" "Well, you people are supposed to be very temperamental," I ventured timidly. "Personally," said Henrietta Starrett, "I have tried so hard to be temperamental but it just doesn't seem to work out. Yesterday I had almost roused myself to a perfectly swell nervous breakdown, but then all of a sudden it sploshed out and I was feeling fine. I doubt if I will ever be able to faint like other women. I have tried but nothing happened." So one more illusion was shattered. "There is another thing," said Henrietta. "People are always asking me whether an artist must read the stories she illustrates. Anybody with the horse sense of a reasonably intelligent horse ought to know better. I am having Kemp invent some sort of bomb that will blow up those persons all at once." "When I was seventeen," said Mr. Starrett in reply to a question, "I wanted to be a newspaper cartoonist and I wanted to get on the Eagle." "The best I could get was a position in the advertising department at six dollars a week. 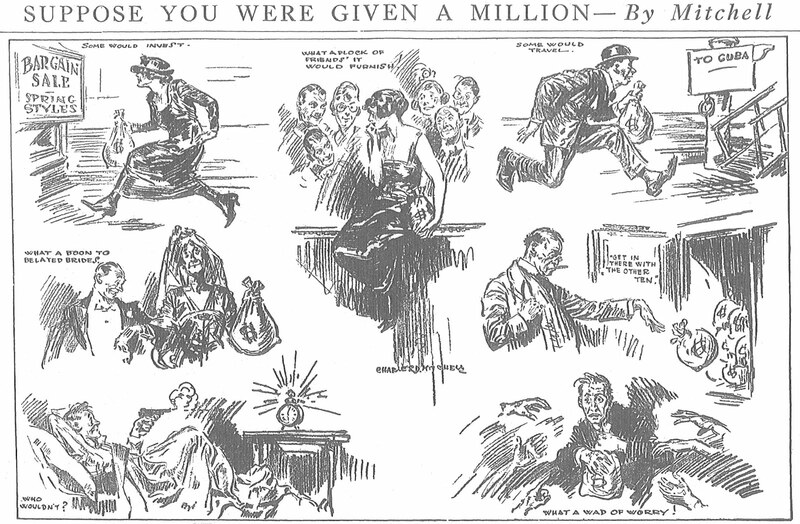 But while there I submitted several cartoons almost anonymously, and they were printed. So when I was fired downstairs, which didn't take long to happen, I revealed my identity and was taken into the art department. I stayed with the Eagle until I had to leave to make way for Nelson Harding. I worked for out-of-town papers for some time after and didn't return to Brooklyn to live until after I had married my first wife, who died in 1918." "Kemp and I set up housekeeping in a duplex studio on Willow Street, on Brooklyn Heights," said Mrs. Starrett. "And speaking of housekeeping, the dinner dishes are piled high on the drain board. "Would you care to help with them?" As we splashed around in the dishpan I became much better acquainted with the Starretts. Kemp was born in New York City, the son of Dr. Heydon Starrett of Brooklyn. Henrietta was born on South Oxford Street, the daughter of the actress, Jane Burby. Her father was a theatrical manager, Charles Collins; her stepfather, Charles Treavathan, a writer and newspaperman (he wrote, among other song hits, "The New Bully," for May Irwin). And her guardian was C.B. Smith, Sunday editor of the North American. So she should have been well taken care of. She spent most of the first seventeen years of her life in a convent. She went from the convent to the stage (to play with James K. Hackett in "the Prisoner of Zenda"), then back to the convent. Twenty-four hours after she left the convent permanently she was in a life class in the Art Institute of Chicago. She used to save her pennies to bet on horses recommended by her stepfather. Then she bet nickels till she had dimes, and dimes till she had dollars. Then she would have to start all over again. She did fashion drawings for a while. But frocks and hats and doodads didn't enthuse her, for no imagination was allowed. So when she had been fired by practically every department store in town she decided to give up. She has been illustrating for the Saturday Evening Post for three years and is gaining in popularity with every issue in which she appears. Both Henrietta and Kemp have been married before. 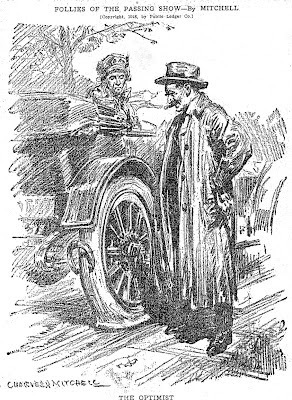 Mrs. Starrett's first husband was Robert McCaig, who also used to illustrate for the Post. Kemp is forty, but not fat. He has been on two other papers beside the Eagle which are now owned by Frank Gannett, the Rochester Democrat and Chronicle and the Albany Knickerbocker Press. In Philadelphia he has worked on Munsey's (now defunct) Times, the Public Ledger and the Evening Ledger. At twenty-five he became cartoonist for the New York Tribune. He has never had a lesson in his life and never expects to take one. He likes humorousillustration best of all, although for some years he did serious illustrating for theSaturday Evening Post, Cosmopolitan, Red Book, Good Housekeeping, and we could go on and on. In selling his stuff to Judge and Life, ten years ago, he used to visit the offices with the artist Norman Anthony, who later became editor of each of those magazines in turn and is now writing stories for Cosmopolitan. The toughest break in his life occurred when one of his magazines discovered it was overstocked, another dropped illustrated fiction, and two others failed, all in one week. When he married Henrietta McCaig he had a check for sixty dollars from a well-known magazine in his pocket. When he cashed it, it was worth twenty-five cents on the dollar. Henrietta says that Kemp ought to have gone to the bank that day instead of The Little Church Around the Corner. She could have waited. They work in the same house, but in separate studios. (So they won't get their paint brushes mixed.) Henrietta has only one. It's as sacred as her toothbrush. And the only place they have ever been homesick for is Brooklyn Heights. [William Kemp Starrett was born in New York, New York on October 6, 1889, according to his World War I and II draft cards. In 1900 U.S. Federal Census, he was the oldest of three children born to Heydon and Emma. They lived in Brooklyn, New York at 805 Herkimer Street. His father was a doctor. In the next census, they remained at the same address. 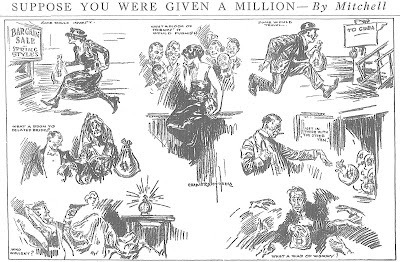 Starrett was a newspaper cartoonist. He signed his World War I draft card on June 5, 1917. He was a self-employed cartoonist and illustrator who lived, with his unnamed wife, in Brooklyn at 54 East 17 Street. His description was tall, slender with gray eyes and black hair. He was part of his father's household in the 1920 census. They lived in Brooklyn at 30 Midwood Street. 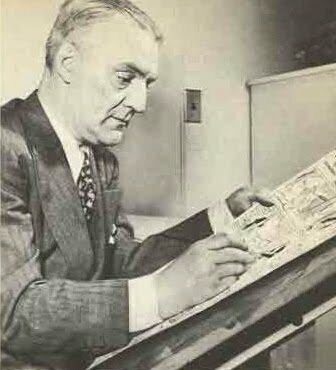 Starrett, a widower, was an illustrator and cartoonist. He remarried to Henrietta McCaig in the early 1920s. A passenger list, at Ancestry.com, recorded them, having returned from Bermuda to New York City, on November 8, 1923. Their address was 30 Willow Street, Brooklyn. In the 1930 census they lived in Forest Hills, New York at 27 61st Drive (Pilgrim Street). Both of them were magazine illustrators. A list of some of their work is at The FictionMags Index. His mother-in-law lived with them. The January 10, 1932 Brooklyn Daily Eagle noted their move to Connecticut: "Mr. and Mrs. W. Kemp Starrett of Pilgrim St. have taken up their residence at their new home at Comstock Hill, Norwalk, Conn." He was the first artist on the 1937 strip, Roy Powers, Eagle Scout. (The first weeks are here 1 2 3 4 6 6a 7 8 9 10 11) In 1939 he took over Vignettes of Life from J. Norman Lynd. Starrett signed his World War II draft card on April 25, 1942. He lived in Phoenixville, Pennsylvania on Ridge Road, R.D. #2. He was a self-employed cartoonist. He was described as six feet tall, 151 pounds, with gray eyes and hair. He passed away July 9, 1952, in Phoenixville. Editor & Publisher published news of his death July 13, 1952. John Norman Lynd was born in Northwood, Ohio on November 15, 1878. His birthplace was recorded on a 1907 passenger list at Ancestry.com, and the birthdate was on his World War I draft card. In the 1880 U.S. Federal Census, he was the only child of John and Belle. They lived in Richland, Ohio. His father was a minister. The New York Times, November 9, 1942 obituary said, "…Mr. Lynd spent most of his youth in London and North Ireland where he was educated…"
On June 1, 1907, he and his brother, Ralph, a foreign correspondent, sailed from Londonderry, Ireland. They arrived in New York City on the tenth; their final destination was 82 Sterling Place in Brooklyn. The passenger list said Lynd's occupation was draughtsman. The Times said, "…He returned to this country in 1907, becoming associated with The Herald soon after his arrival…." In the 1910 census, he was married to Isobel, a Welsh emigrant, and lived in Manhattan, New York City at 522 West 136 Street. They had been married for two years. The household included his brother and sister, Dora. Lynd worked at home as an artist. He signed his World War I draft card on September 12, 1918. He lived at 300 Denton Avenue in Lynbrook, Long Island, New York, where he was a newspaper artist. His description was tall, medium build with blue eyes and brown hair. In 1919 he produced You Know How It Is. The couple was at the same address in the 1920 and 1930 censuses. He was a self-employed artist. In the Times-Picayune (Louisiana), Lynd took over, from Frank Godwin, Vignettes of Life, on October 23, 1927 and stayed on it through mid-1939. The Times said, "…[He] left The Herald when it merged with The Tribune and did freelance work and magazine illustrations until five years ago, when he joined King Features, Inc. His most recent syndicated cartoon was the 'Family Portraits' series." Lynd passed away November 7, 1942, at his home in Lynbrook, according to the Times. The cause was a heart attack. Francis Wood "Frank" Godwin was born in Washington, D.C. on October 20, 1889, according to his World War I and II draft cards. In the 1900 U.S. Federal Census, he was the third of four children born to Harry and Annie. His father, who had passed away before the census, was an editor at the Washington Star, according to a New York Times obituary, August 6, 1959. Harry's brother, Thomas, a photographer, lived with the family. They lived in Hackensack, New Jersey on Maple Avenue. The New York Times said, "…As a young man he became an art apprentice for The Star and attended the Art Students League of New York. He became a friend of James Montgomery Flagg, the artist, with whom he shared a studio at one time. Mr. Godwin did cartoons for Judge magazine." On November 25, 1909, Godwin married Grace Congleton in Hackensack, as reported in the New York Times on the same day. In the 1910 census, the couple lived in Washington, D.C. at 3138 Q Street. His occupation was newspaper artist. Godwin signed his World War I draft card on June 5, 1917. He lived in Philadelphia at 620 Washington Square, and was an artist at N.W. Ayer & Sons. His description was tall height, medium build with blue eyes and black hair. The Washington Post, August 29, 1918, noted his progress in the army, "…Fourteen more Washington men have been commissioned in the army as follows:…Francis W. Godwin, 1466 Chaplin street northwest, second lieutenant, sanitary corps…" The Milwaukee Journal (Wisconsin), August 30, 1931, published a profile of Godwin that said, "…When the World War came he went in as a motion picture camera man, but was soon assigned to the air service, where he became a pilot." He has not been found in the 1920 census; perhaps he was still serving in the army. His wife, four children and mother-in-law lived in Manhattan, New York City at 107 Waverly Place. His wife was the proprietor of a tea room. The New York Times said, "…Godwin had done illustrations for Collier's, Liberty and Cosmopolitan magazine…" In 1924 he started Vignettes of Life, which was taken over by J. Norman Lynd in 1927. In the mid-1920s he divorced his wife. 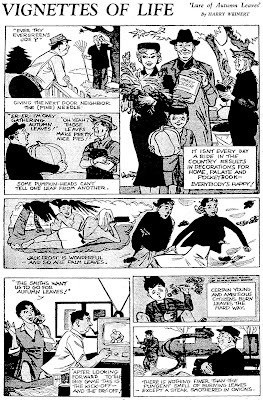 His strip Connie began in 1929 (not 1927 as widely reported -- Allan). His illustrated books include The Blue Fairy Book (1921), Uncle Henry (1922), Robin Hood (1923), The Black Arrow (1923), Tales From Shakespere (1924), Treasure Island (1924), Kidnapped: The Adventures of David Balfour (1925), Robinson Crusoe (1925), King Arthur and His Knights (1927), The Ten Dreams of Zach Peters (1927), The Swiss Family Robinson (1929), and The Book of Courage (1929). The 1930 census recorded him, his wife Sylvia and two children in Greenwich, Connecticut on Hendrie Avenue. Oddly, his occupation was "lawyer". His first wife, who had remarried, and children had moved to San Diego, California. 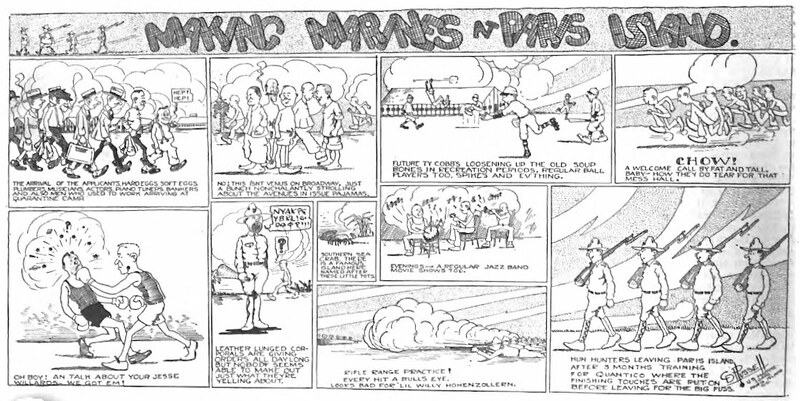 In 1938 he drew a portion of the Roy Powers, Boy Scout series. On two occasions, March 1938 and September 1939, he and his wife sailed to Havana, Cuba. Their home address was 230 East 73rd Street, New York City. On April 27, 1942, he signed his World War II draft card. He lived in New York City at 153 East 45 Street. He was self-employed, and his description was six feet two inches, 300 pounds, with blue eyes and black hair. His strip Rusty Riley started in 1948. The New York Times said, "…His brother, Harold P. of New Hope, does the continuity for the weekly version of 'Rusty Riley.' The daily continuity is done by Rod Reed…." He married a third time. The American National Biography: Gilbert-Hand (1999) said, "...He married Georgiana Brown Harbeson shortly after the end of World War II." The New York Times said, "…Godwin was vice president of the Society of Illustrators, a member of the Salmagundi and Dutch Treat Clubs in New York and a former member of the National Press Club in Washington." A profile of him was published in the Portsmouth Times (Ohio) on May 17, 1952. Godwin passed away, at home, August 5, 1959, in New Hope, Pennsylvania. The cause was a heart attack. The New York Times published his obituary the following day. CONNIE daily strips started in May 13 1929. CONNIE Sunday page is reported starting in Novermber 13 1927. If this is not true, what's the real start date of CONNIE Sundays? The Connie strip numbered 97 ran in The Day of New London on July 1, 1929. This is the earliest issue on Google News. You can't actually see the number there, but you can several days later. 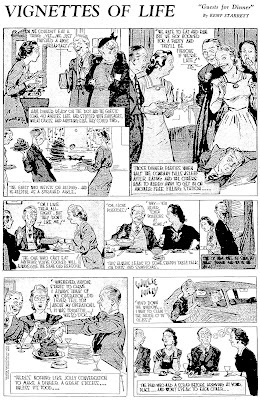 Assuming they didn't run that one early, the daily strip must have started at least by March 10, 1929. But I can't be of any help for the Sundays. The Connie Sunday began 4/28/29. 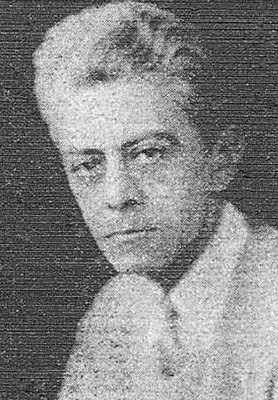 Louis Wilfred "Lou" Hanlon was born in Brooklyn, New York on October 12, 1882, according to his World War I and II draft cards; his full name is from Who's Who in American Art, Volume 2 (1938). In the 1900 U.S. Federal Census, he was the oldest of five children born to Michael and Jennie. They lived in Brooklyn at 139 Cumberland Street. His father was a printer and he was a designer. The date of his move to Pennsylvania is not known. Who's Who said he was a pupil of the Pennsylvania Academy of the Fine Arts, Drexel Institute, and the Pennsylvania Museum and School of Industrial Art. 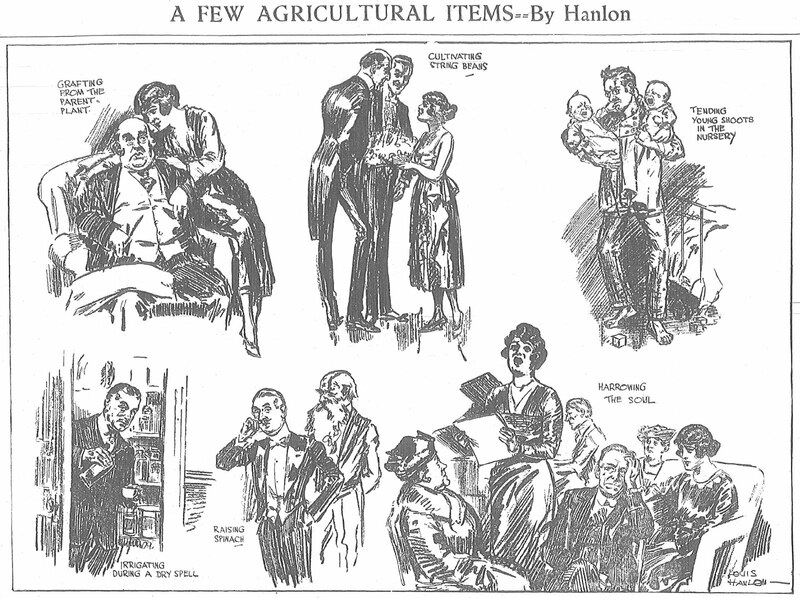 In 1910 Hanlon lived in Aldan, Pennsylvania on Providence Road, just west of Philadelphia. He was a newspaper artist. He signed his World War I draft card on September 12, 1918. He lived in Philadelphia at 1022 Walnut. His occupation was newspaper artist at the Public Ledger. His nearest relative was his wife Anna. He was described as medium height and build with brown eyes and hair. The 1920 census recorded the couple in Philadelphia at 277 Eleventh Street. He continued as a newspaper artist. In the Brooklyn Daily Eagle, he followed Charles D. Mitchell on Follies of the Passing Show, starting on April 4, 1920. The New York Times, May 6, 1954, obituary said, "…Mr. Hanlon had worked for The New York Journal, The Chicago Tribune, The Philadelphia Ledger and Philadelphia North American." A 1924 issue of Printers' Ink reported that he joined The Ben Dale Company, advertising art, in New York. According to the Times, he was an original staff member of The New York Daily Mirror, which he joined in 1924. According to the 1930 census, he lived in Richmond Hill, Queens, New York at 90-06 107 Street. The newspaper artist had married when he was 36 years old. His daughter, Cecelia, was eight years old. In November 1935, a Society of Illustrators benefit show offended a few members in the audience, and five artist's models were arrested. 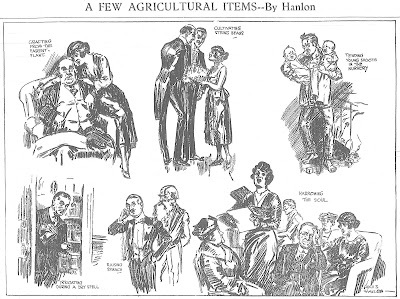 Hanlon was among the group of six illustrators who appeared in court. In the mid-1930s he produced The G-Man. On April 25, 1942, he signed his World War II draft cards. He remained in Richmond Hill at a different address, 86-31 105 Street. He worked for the Daily Mirror. His description was five feet seven-and-a-half inches, 150 pounds, with brown eyes and gray hair. In March 1946, he was a member of the National Cartoonists Society. Hanlon passed away May 5, 1954, in New York City. The Times said he died "…of a heart ailment. He was a charter member of the Society of Illustrators and a member of the Silurians, a society of old-time newspaper men; the Philadelphia Pen and Pencil, and the Circus Saints and Sinners. Mr. Hanlon was an amateur astronomer and actor and an authority on Shakespeare and Gilbert and Sullivan." He was buried at the Saint John Cemetery in Middle Village, New York. Charles Davis Mitchell was born in Wilmington, Delaware on May 18, 1885, according to the Delaware Birth Records at Ancestry.com. Who Was Who in American Art (1985) has the same place and date. In the 1900 U.S. Federal Census, he was the oldest of three children born to Charles and Caroline. They lived in Camden, New Jersey at 401 North Second. His father was a contractor. Mitchell provided interior illustrations for the Saturday Evening Post as early as April 1907, and continuing into the mid-1920s. The Mitchell family was recorded in the 1910 census in Philadelphia, Pennsylvania at 5713 Thomas Avenue. He was a magazine illustrator. His other profession was actor. 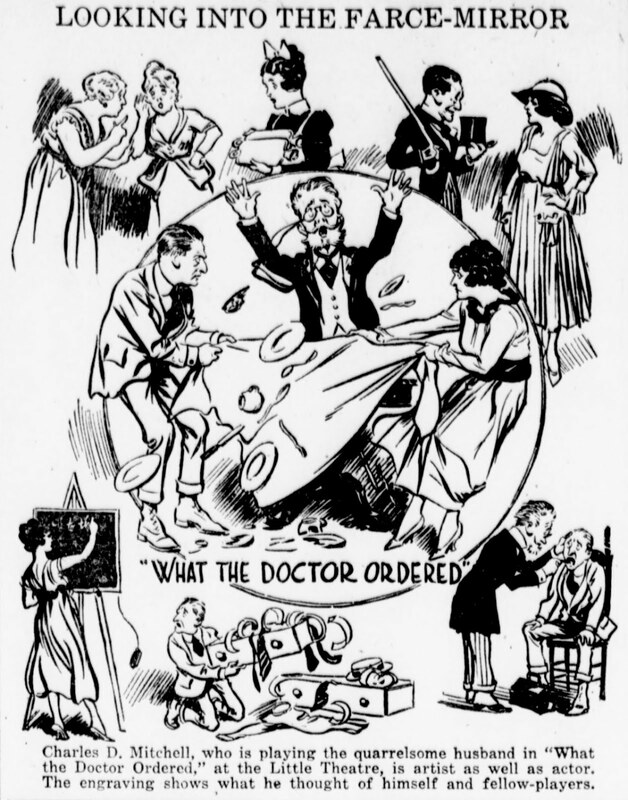 He drew himself and others in the play, What the Doctor Ordered, for the Public Ledger, February 27, 1917. The Public Ledger published his Follies of the Passing Show beginning in July 1917. His final Follies was published March 28, 1920. He signed his World War I draft card on September 12, 1918. He lived at 210 Rutgers Avenue in Swarthmore, Pennsylvania, and was a newspaper cartoonist for the Public Ledger. He named his wife, Reba Baxter Mitchell, as his nearest relative. His description was medium height and build with blue eyes and brown hair. American Art Annual Volume 16 (1919) listed his address as "518 Walnut St., Philadelphia, Pa."
In the 1920 census, he lived in Springfield, Pennsylvania at 210 Rutgers Avenue. His daughter was 25 months old. He was an illustrator. During Prohibition, the Public Ledger sought the opinions of performing and visual artists about the absence of spirits. On June 8, 1922, Mitchell said, "Art need no stimulus, and the idea that wines or liquor of any kind are necessary for the production of good work is all wrong. It neither makes for better art, or a better appreciation of it. It would be a poor kind of art that depends on a false stimulus. Logic and common sense point out that better work is produced from a clear mind. A befuddled brain don't make for a particularly high grade of work." 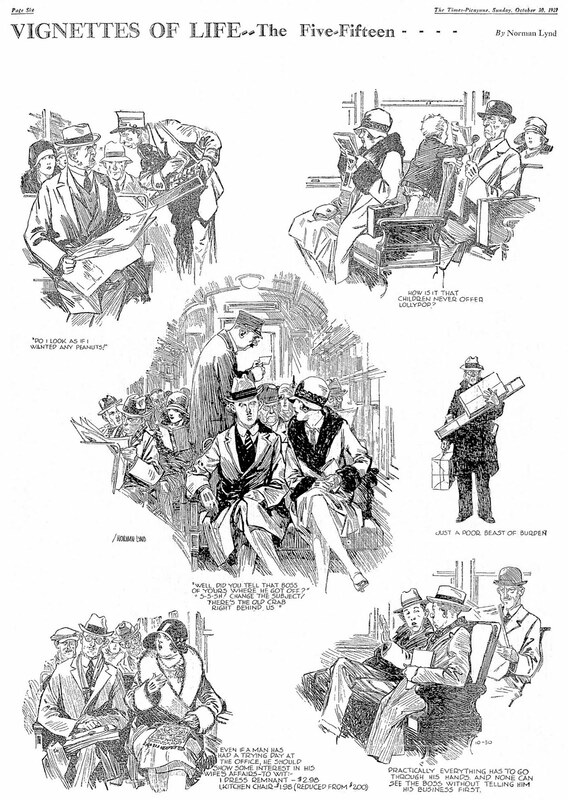 Social Snapshots was another weekly feature he produced during the 1920s. 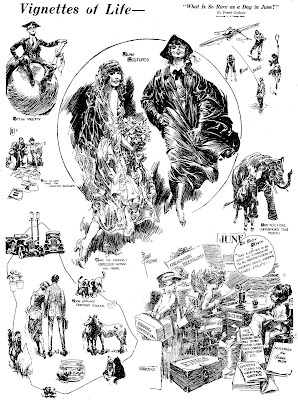 In the second half of the 1920s, Mitchell contributed to The Delineator, Liberty, College Humor, McCall's and others. He has not been found in the 1930 census. His magazine contributions included Physical Culture, Good Housekeeping, Ladies Home Journal and Redbook. On August 22, 1938, they arrived, aboard the S.S Queen Mary, in New York City from Southampton, England. Mitchell passed away March 30, 1940, in Charleston, South Carolina, according to the New York Times, which published the news on April 2. The article said he was 53 years old, which was incorrect, so most sources have 1887 as his birth year. Very interesting. This is the most I've been able to read about Mitchell. I have two of his original drawings (charcoal?). Where could I find out their value? Sites like askart or artinfo will have records of what their previous artwork has sold for at auction. Charles D. Mitchell's pieces mostly sell for around $200-600. I'm curious to see what pieces you own, would you email me? Thanks for the info and rare photo of Charles D. Mitchell. He is a highly underrated artist in my opinion. He was a very accomplished draftsman. I am fortunate to own two of his drawings. Clarence Davis Russell was born in Buffalo, New York on August 19, 1896, according to his World War I and II draft cards. The same birthdate was recorded in U.S. Veterans Gravesites, ca.1775-2006 at Ancestry.com. His birth has been stated simply as 1895 in books and websites. In the 1900 U.S. Federal Census, he was the first of two children born to Hamilton and Elizabeth. They lived in Buffalo at 43 East Balcom Street. His father was a bookkeeper. In the next census, they remained in Buffalo, but at 143 North Pearl. His father was a claims agent. According to his New York Times, October 25, 1963 obituary, he studied at the Chicago Art Institute. 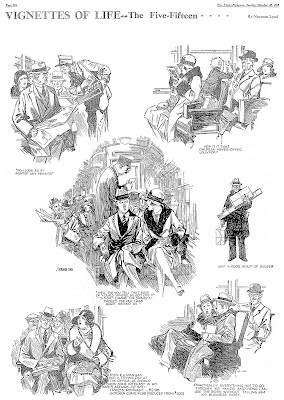 In the World Encyclopedia of Comics (1976), Maurice Horn wrote, "…after freelancing cartoons to magazines around the country, he came to New York City in 1915. When WWI rolled around he enlisted in the Marines, became sports editor of The Leatherneck, the Corps' publication, and was sent overseas with the American Expeditionary Force." Russell signed his World War I draft card on June 5, 1918. He resided at 136 East 16th Street, Manhattan, New York City. He worked for the Western Electric Company. His description was medium height, slender build with blue eyes and light brown hair. History of Buffalo and Erie County, 1914-1919 (1920) had this entry, "Russell, Clarence D.—1st-class Pvt., Co. F, 11th USM." The Western Electric News published one of his cartoons (below) in its August 1918 issue. Russell has not been found in the 1920 census. 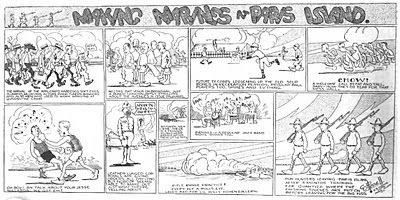 According to Famous Artists & Writers (1949), "…in the early Twenties [he] worked for the old New York Evening Post and Evening Mail....Russell's professional interest in tramps began around 1927...'I began drawing tramps for Judge, the old humorous magazine...and pretty soon Pete [the Tramp] began to evolve..." (The entire profile is here.) He produced ads titled Electrified History for Western Electric. He has not been found in the 1930 census. Famous Artist & Writers said, "He signed a contract with King Features in 1930." According to E. Simms Campbell's January 29, 1971 obituary in the New York Times, "...C.D. Russell, creator of 'Pete the Tramp,' encouraged and advised him..." His strip Pete the Tramp, began on January 10, 1932. Snorky was one of three toppers he used on Pete the Tramp. A 1937 issue of the Judge printed instructions for his word game. Before the paper and pencils are put back in the desk drawer, a neat game for groups of two, three or four is "Letter-Go," an invention of cartoonist C.D. Russell, who is also the inventor of Pete the Tramp. Each player rules off, free-hand, a box containing twenty- five squares. This is done by making six horizontal lines about a half inch apart and crossing them with six more half inch apart vertical lines. The players then take turns in calling out letters. Each letter, as it is called, must be placed by each player in any one of his twenty-five squares, and no erasing either. The object is to make words horizontally and vertically. When all the squares have been filled in, papers are exchanged and scores totaled. A five-letter word counts 10, a four-letter word 5 and a three-letter word 2. Two-letter words don't count at all. Neither do proper names nor foreign words. Also, adding an "s" on the end of a singular word to make it into a plural is just a waste of time. Your opponents will only allow you the singular. A perfect score is 100 — five five-letter words each way. But in stiff competition you should be able to pick up the marbles with anything in the neighborhood of 70. Russell signed his World War II draft card on April 27, 1942. He lived in Atlantic City, New Jersey. He was a cartoonist for King Features. His description was 5 feet 8 inches and 165 pounds, with blue eyes and gray hair. He was involved in the founding of the National Cartoonist Society in 1946. Russell passed away on October 23, 1963, according to U.S. Veterans Gravesites. However, the New York Times October 25 obituary said he, "…died of cancer Tuesday [October 22] in Kingsbridge Veterans Hospital, the Bronx. He was 67 years old and lived in Fort Lee, N.J." That Tuesday date was used in the World Encyclopedia of Comics. He was buried at Long Island National Cemetery in Farmingdale, New York. Pete the Tramp ended December 22, 1963. A list of his comic book credits is at the Grand Comics Database.